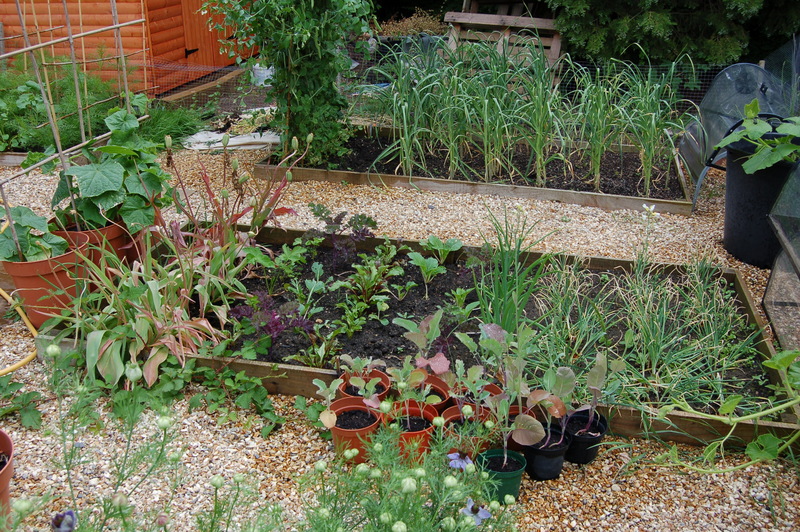 I took these photos a week or so ago, even in that time a lot has grown but I am about to start the first big dig up (such as the garlic) so here they are, oh, and please excuse the mess, it’s as much as I can manage to water the vegetable patch in this heat, let alone tidy it. Bed 1 is as it was planned in the cold Winter, when I dreamed of hot Summer days and what we would like to grow and eat. 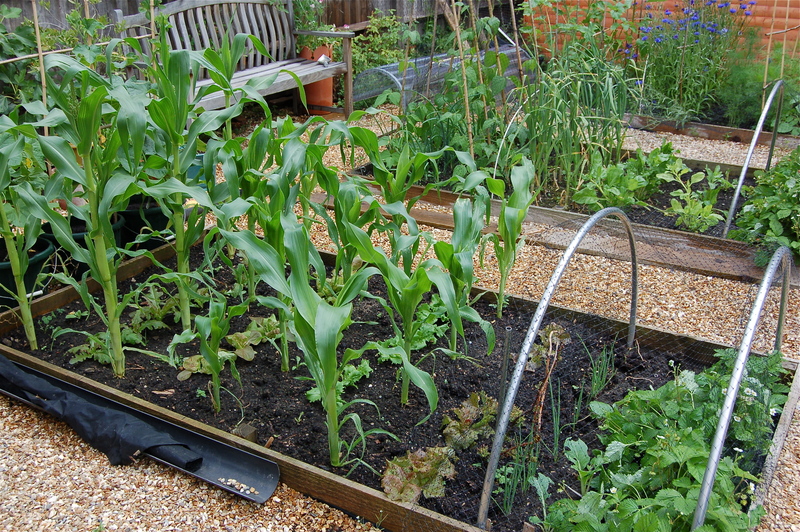 It has Sweet Corn with salad crops between, a single row of Spring Onion and 5 plants of Alpine Strawberry (on their first year so only lightly cropping). 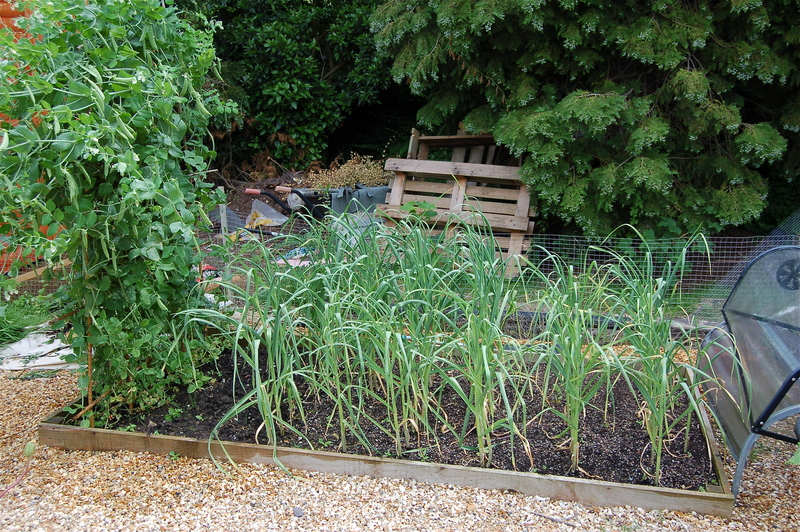 Bed 2 has a double row of Barlotto Beans, with some Red Onions between (I heard on Gardeners’ Question Time that you should never plant beans with onions – oops! 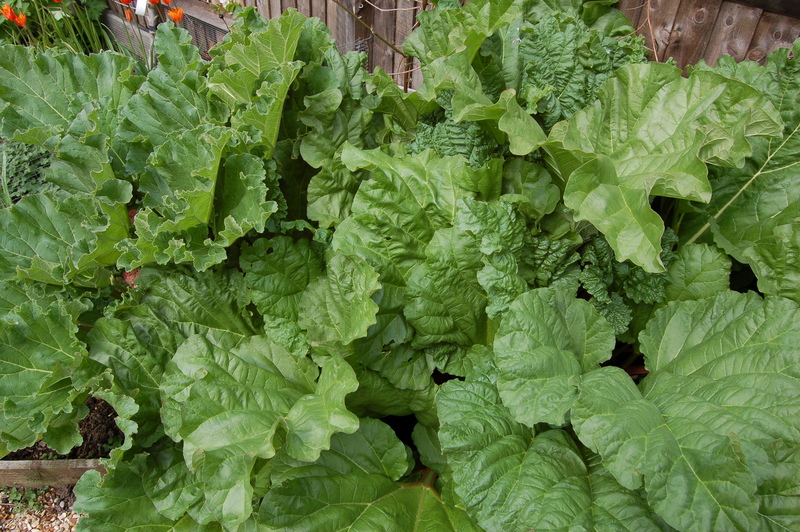 ), Garlic, Chard and again, Alpine Strawberries (on their third year and producing masses). 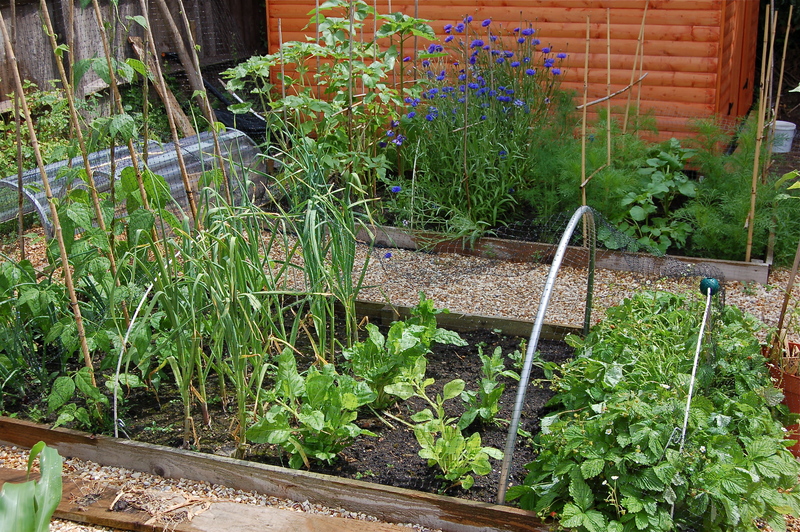 Bed 3 has Sugar Snaps (about to end) and Garlic, about to be pulled out to make way for Broccoli which is sitting in pots at the moment, wilting. Bed 4 which I stole from the cutting flowers this year, is a bit messy but contains Parsnips, Kale, Beetroot, Pak Choi, Red Onions and Shallots. Right, I need to dash out for another watering session as we’ve had yet another hot day without any sign of rain. Time for a quick catch-up, as it’s all go in the vegetable patch and there’s quite a bit to write about. 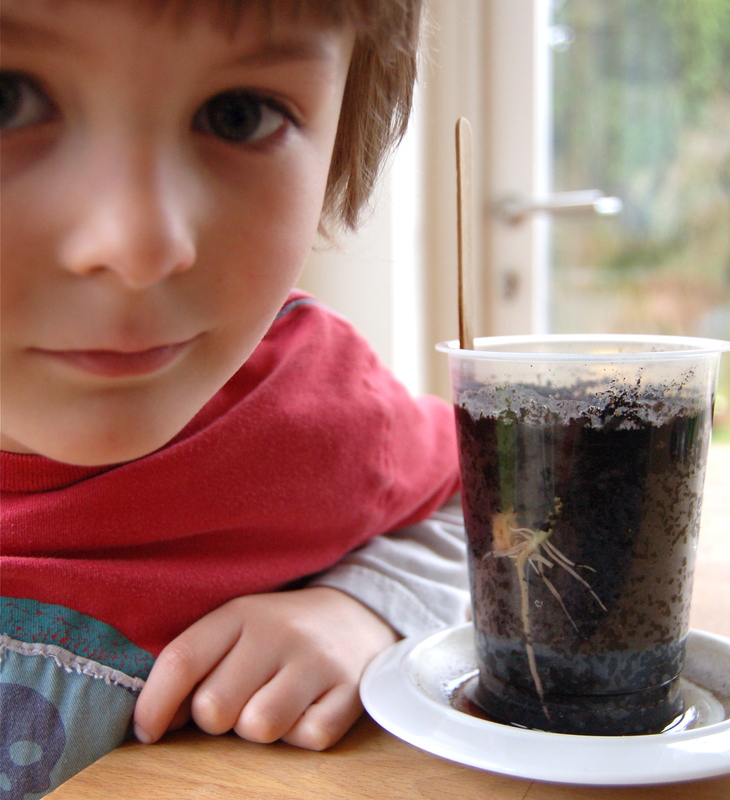 I re-planted new beans in fresh soil after the original failure to germinate, but following a bean growing project I did with Felix where we planted his beans in an old see-through yoghurt pot (planted against the side so we could watch it grow – we did this as kids in jam jars and I figured he would enjoy it) I used smaller see-though yoghurt pots, with holes punched in the bottom, that way I could see the germinating beans and not have to keep prodding in the soil. Worked a treat and they are now planted out with canes for support, in two rows. The rows are 45cm apart and the beans about 20cm apart, so 5 per row. The support canes are tied together at the top and I’ve covered the whole bed in netting to stop the evil pigeons getting in. I haven’t replanted these although now my see through pots are free I might put some in. I have mad mass germination of all the courgette and squash seeds that I’d given up on and emptied back in the compost bucket. I’m not entirely sure what they all are (I’ve saved 5 by planting them up into pots) but for 2 I could see the actual seed shell still and think I’ve got 1 each of ‘Sweet Dumpling’ & ‘Crown Prince’. I will plant one on the compost pile and it looks like my ‘Butternut Harrier F1‘ isn’t really growing so the other can go in that giant pot. All new seed germinated well, they are waiting in the greenhouse to be potted up. Again, the new seeds have germinated, some only just but I should get at least 2 of each plant. Are all the salad seedlings (or plants as most are now). I am waiting for the nights to get a bit warmer then I’ll plant them up into final pots, most will be grown in the greenhouse but some (half the tomatoes, the cucumbers etc) will go outside. The tomatoes have made an amazing recovery from their limp earlier selves and potting them on deep has given them good strong stems, so that’s great news. Beetroot – ‘Pronto’ & ‘Burpees Golden‘ in a gutter for planting out later (second sowing). 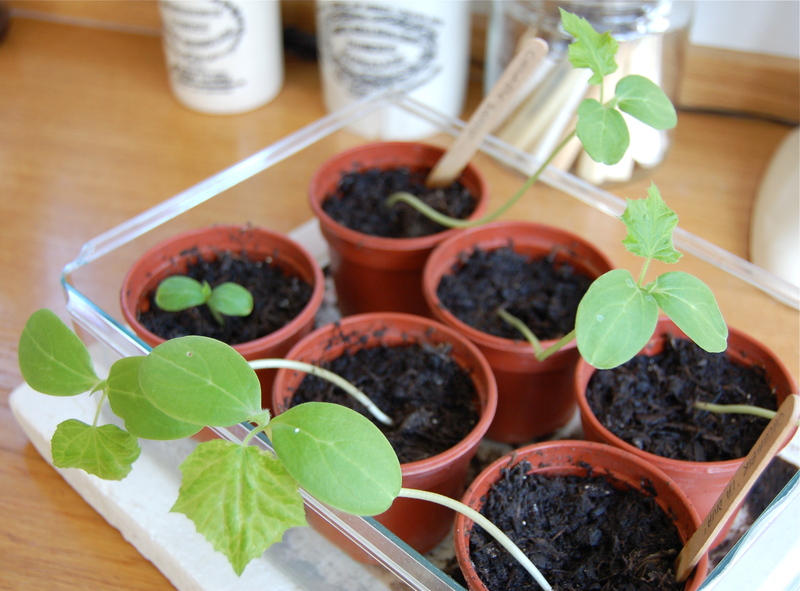 Pea – ‘Sugar Snap‘ in a gutter for planting out later (second sowing). 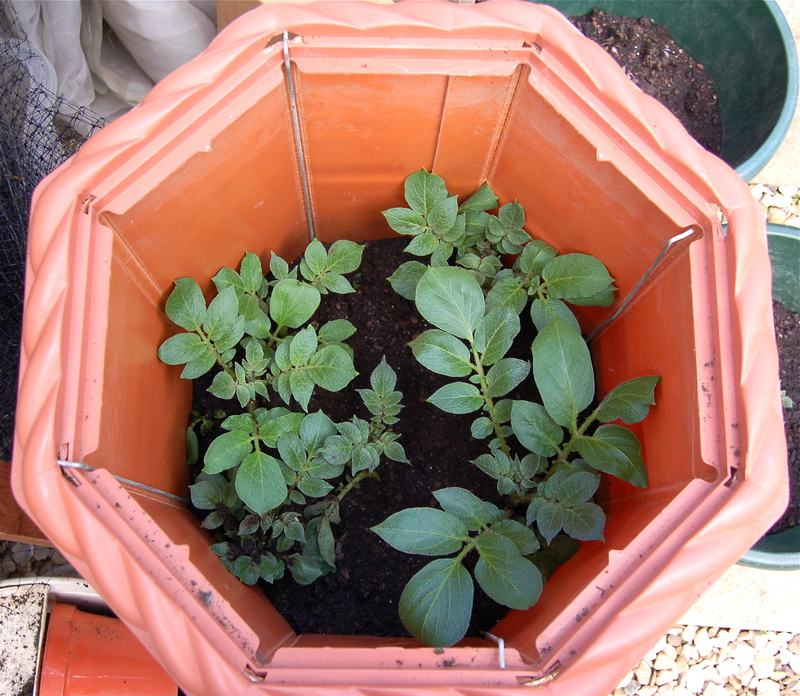 I moved the potato barrels out last week as they are getting quite heavy, they need ‘earthing-up’ as the foliage grows, which as I plant in containers simply means keeping the stems covered in soil so they are kept in the dark and potatoes can form all the way up. I simply tip John Innes 2 in every so often, making sure I leave the top leaves free. Once the soil reaches the top of the barrel I will start the feed the plants but more on that later. I also found this strawberry/herb pot in my local garden shop and have used it to plant some of the Alpine Strawberry plants that have been sitting in the greenhouse since last year. The Strawberry pot is really rather small but it’s better than letting them got to waste and as Charlie is addicted to picking them off the plants in the raised beds, he has a few more plants to go at. I noticed that Crocus have a brilliant ‘Young Plants Collection‘ collections for anyone who has left it too late to start from seed, this would have been my back-up had the tomatoes not recovered and I have resisted the urge to buy anything I’ve missed as really there is no growing room left in the garden once everything is planted out. Despite the pigeons best efforts to destroy my Purple Sprouting Broccoli, we have still managed a pretty decent crop. The birds took out all the leaves early this year, so quickly that I didn’t have a chance to do anything about it, but as soon as I noticed I covered the remaining stalks (with the odd half leaf still attached) with netting and it did the trick as the plants revived and have been producing quite a decent crop. Harvesting them is pretty obvious, you cut off the main stem first and then the side shoots should keep growing to provide lots more florets. They taste a lot nicer than shop bought but do need a good wash before eating (unless you like added protein!). 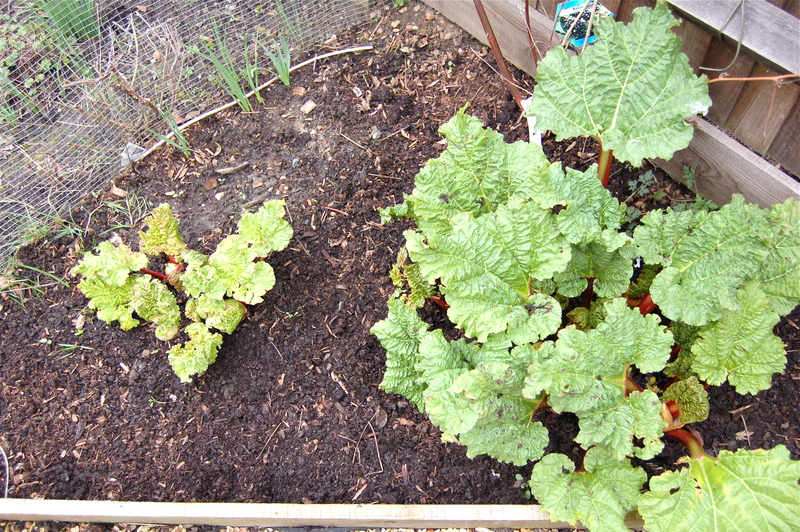 Back in March the rhubarb looked as above, but now it’s turned into a triffid! It’s only year three for the rhubarb crowns, in the first year I didn’t pick any stems, as that’s what the ‘rules’ say and in year two I picked only a few but as you can see it’s totally paid off because I can now harvest to my hearts content. I had hoped to make something yummy, maybe some jam or chutney and so add some fancy photos and recipes to this post but time has flown so I shall get this published and add another cooking post at a later date….oh, I did make rhubarb bellinis last year which were rather nice and worth making again. On Saturday (before the storms of Sunday) I spent a good hour in the garden, the boys were a bit stir crazy and the weather was good so we went outdoors for a run around. It always surprises me how much you can get done in a small time, really the veg patch was a bit of a mess and in just an hour I cleared a lot away, dug out quite a few weeds, cleared all the pots and apple crate planters, in general made a mess quite presentable. 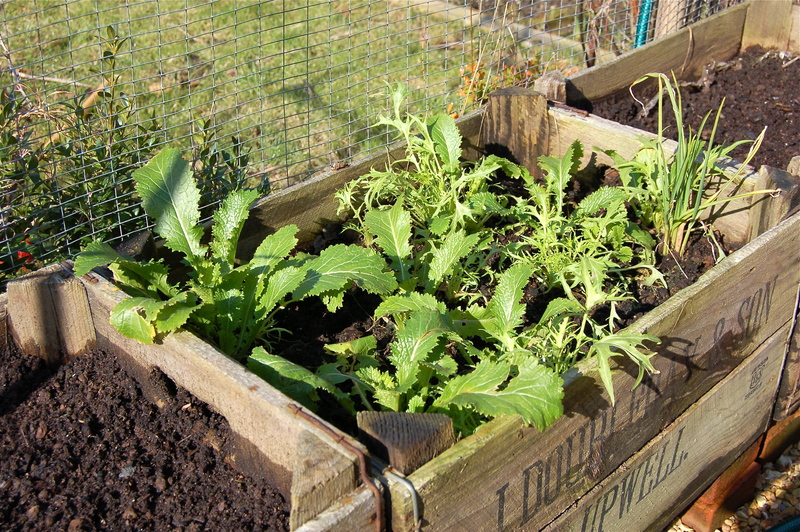 In four of the apple crates, the last still has Mizuna/Mibuna (as above) that has survived all winter, not sure how it will taste, we’ll try some soon. Really it’s a bit early to be sowing these but we are due rain and warm-ish weather so I’ll give it a go and I can always cloche them if I need to. I used to plant nice neat rows of lettuce, in contrasting colours (it looked very pretty) but I just chucked the seeds all over the place this time, one type per crate. In the pots, I cleared through one containing Parcel, again that has been on the go all winter, I thinned it cut it back and added a lot of new soil so we’ll see if it flourishes again. The only other pot to survive is Thyme ‘Old English‘. 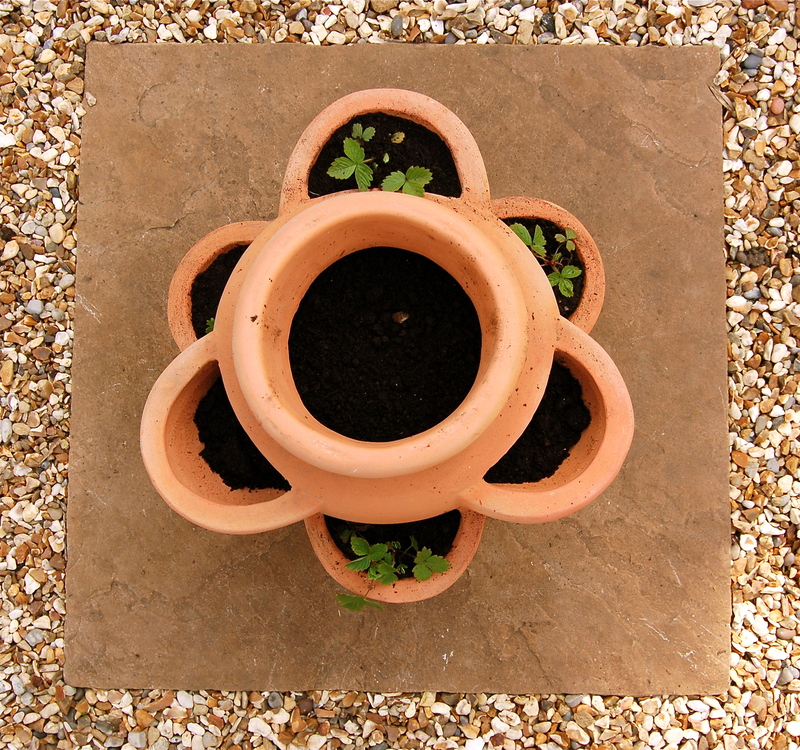 I now have a few cleaned and ready pots for planting further herbs when it gets a bit warmer. In the raised beds I started planting up Bed 3 which is normally used for flowers, I have decided to rotate it to veg this year. So far it has 2 x Kale that have survived the winter but have never really taken off, if the slugs don’t get them they might still grow. I have also planted out 3 rows of Shallots (‘Longer’) as per last years instructions and finally a row of Parsnip (‘Gladiator’) seeds, these are on their third year and as parsnip seeds don’t keep in theory wont germinate but they did last year so we’ll wait and see. The dotted lines are spring bulbs planted very deep from when this bed contained flowers so I’m limited to what I can put there, although I may plant some Lettuce or Radish between. Inside the house all the seeds planted back in the last post have germinated. I was extremely surprised to see the Cucumber seeds poking through in less than a week! After last years pathetic attempts is seems the trick is to keep them nice and warm under a radiator. They are getting a big leggy so will need to planted up soon into bigger pots with most of the stems buried to root more firmly. 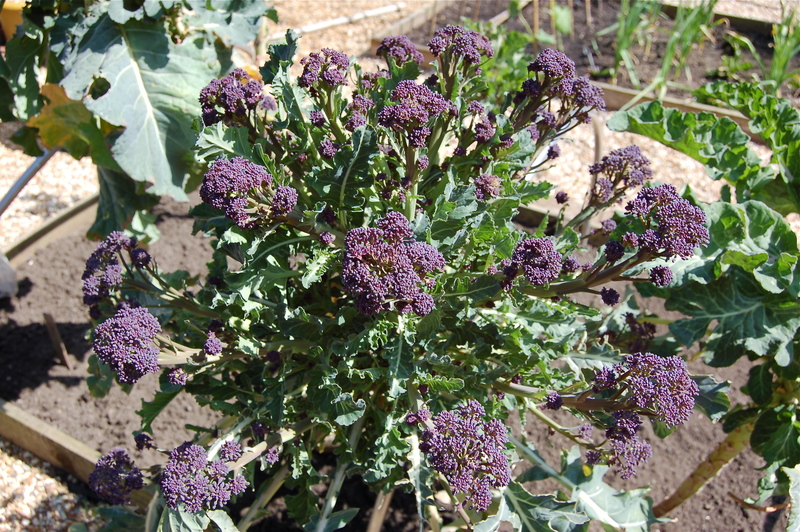 Finally, the blooming birds pretty much destroyed my glorious Red Sprouting Broccoli, I have been growing 6 plants in Bed 1 since last year and they were doing really well, I was rather looking forward to weeks of florets but went out one day to find them pecked to pieces. I have thrown a net over and hope to still get some florets to eat, I swear, I nearly cried! Also, the Broad Beans ‘Super Aquadulche‘ didn’t appreciate the harsh weather we’ve been having and gave up, I have cut the stems back to the bottom (as they might sprout back) but today I pushed some new beans into the soil in the hope there will be enough goodness for them to grow. I think I put in some Winter Purslane as well but to be honest can’t be sure. 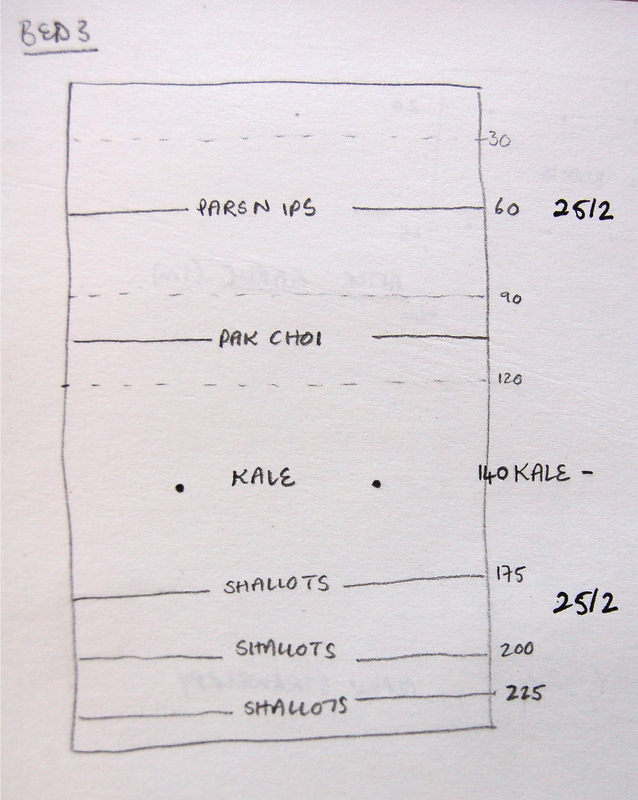 I was in a hurry and rather stupidly though I would write down what I had planted where and then didn’t, however I do have 5 apple crates now sprouting a mix of seeds (usually 2 types per crate spaced as instructed on the packet). This is why I should REMEMBER TO LABEL WHAT I PLANT!!! My garlic arrived, as ordered a while ago from the Isle of Wight Garlic Farm. As in this post, I have decided on only planting Albigensian and Solent Wight this year, the bulbs were massive so I planted all the cloves (I sometimes discard/eat the smaller ones in the centre) and they have taken up the best part of two of the raised beds. This is not ideal but I got annoyed this summer with the garlic being spread over the garden, including in the flower borders so I decided to sacrifice another raised bed in the veg patch. For the full garlic ‘how to’ post read here. There is still plenty of time to still order and plant garlic, some can go in as late as Spring but I prefer to give them an Autumn start. Still growing nicely in the garden are the Alpine Strawberries (Mignonette) which Charlie strips every day. I am slightly amazed that 5 small plants are providing so many fruit over such a long period, they are a definite favourite and the extra 5 plants I have planned for next year are in place and growing well. The Purple Sprouting Broccoli (Red Arrow x 2, Rudolph x 2 & Late Purple x 2) planted in the greenhouse in April and then in the bed after the garlic are an amazing size, I had to abandon the Enviromesh as it was rather crushing the leaves so I do a regular caterpillar patrol and the pick them off. The late purple is rather lagging behind but is still doing well. Also still in there are my Parsnips (Gladiator) which I will leave until after the first frosts, ideally not too long as last year they ended up rather large! Today I planted my final seeds (I think, unless I try and dash in some Spinach or some new herbs), Broad Bean (Super Aquadulche) which can be planted now and left over winter in a sheltered spot for an early crop. Last year I planted 2 per bucket with John Innes No 2, this year I am going for 3, I had hoped to add a scarlet broad bean but have failed to find one and I saved quite a few beans for planting from the S. Aquadulche so want to make sure I use them. All I have to do now is try and remember to water them!